Why Choose Overhead Door Co. of Greater Cincinnati for Garage Door Service? When you’re searching for a garage door company that embodies integrity, knowledge and excellent service, look no further than Overhead Door Co. of Greater Cincinnati. We have the experience, knowledge and technology to offer high-quality products and service throughout southwestern Ohio. In addition to repairing and replacing garage doors, we also install commercial doors, residential front entry doors, patio doors and storm doors. Simply call us at (513) 394-6938 or contact us online to ask us a question or schedule service for garage doors and more! Do you need garage door service in the Cincinnati, Ohio area? You’ve come to the right place. Overhead Door Co. of Greater Cincinnati has been serving the area for over 90 years. From Amberley to White Oak, we provide the finest in residential and commercial garage door services. In addition to the highest quality garage doors, Overhead Door Co. of Greater Cincinnati offers excellent customer service and provides 24-hour emergency service for homes and businesses. Your garage door is helping protect one of your biggest investments (your home), so making sure it stays in top working condition is extremely important. This comes down to three things—correct installation, timely repair and proper maintenance and care. Overhead Door Co. of Greater Cincinnati can help with all three! 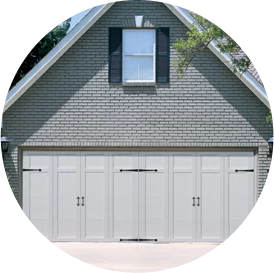 We offer garage door installation and garage door repair services in the southwestern Ohio area and can give you tips for proper garage door maintenance and care to help prevent problems that could leave your home unprotected. If you need new garage doors for your commercial building (warehouse, firehouse, storage facility, etc. ), replacement is urgent. Leaving your business unprotected could mean a loss in productivity and important finances, as well as damage to your reputation. A properly working garage door can prevent this by providing protection against harsh weather conditions and burglary. In addition to garage doors, Overhead Door Co. of Greater Cincinnati also installs front doors, storm doors and patio doors. We have the people, knowledge and unequaled abilities to complete any door package, from single-door projects to large, complex custom orders. “Customer service is our business” is not just a motto, but a true method of doing business. We offer 24-hour emergency garage door service, seven days a week, 365 days a year. In short, we are here to get you out of the fix you’re in—whenever you need us. Call us at (513) 394-6938 or contact us online to ask a question or schedule service! Welcome to Overhead Door Co. of Greater Cincinnati, your source for professional garage door installation for homes and commercial spaces. Builders and homeowners throughout southwestern Ohio depend on us for a variety of products and we are proud to serve them.